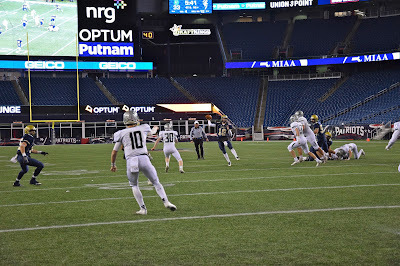 Shrewsbury's run ultimately came up short at Gillette, but with sophomore quarterback Drew Campanale (10) hanging around for another two seasons, the Colonials might be back. Photo by Nate Weitzer. Click to enlarge. While no Central Mass team was able to bring home a state championship in 2016, it was still an exciting year of football around the region. Between the intense battle in Division 2 (both before the playoffs and during), Grafton's amazing run, and the Cinderella story of the Maynard Tigers, this was a year we will be talking about for a while. It was pretty tough to choose a true No. 1, but here is our crack at it after a memorable season. Thanks to everybody for reading, and be on the lookout for our Central Mass All-Star team later in the week, and first ever All-State team as well. If you'd like to see where Central MA's best stack up against the rest of the state, also be sure to check out our final statewide Top 25. Now, onto our final CMass Top 10, and first 10 out. Please note that all of our "previous rankings" came at the end of the regular season, and the playoffs caused a LOT of movement. I'm really splitting hairs here between Grafton and Shrewsbury. But, in the end, I'm going with the team that dominated for nearly the whole season, over the team that went on a magical run in a higher division. Please direct your complaints to the comments section, but know that I get anybody who feels Shrewsbury should be here. I'm taking the Indians, however, and this Grafton team deserves it. With a punishing ground game, led by Syracuse-bound back Ifeatu Melifonwu, and a smart and physical defense, led by linebacker Jack Fontana, Grafton was a complete and overwhelming force in D3 Central. Every time it seemed like the Indians would be tested, they turned challengers away. A showdown of undefeated teams against Auburn, that would determine both the league champion and top seed in the playoffs? Grafton won 34-0. A showdown with Quabbin, Central MA's most prolific offense? Grafton scored 51 points to win a shootout. Taking on red-hot St. Peter-Marian in the playoffs? Grafton pitches a shutout and ball-controls the Guardians out of the building. Things didn't end the way they wanted against Hanover in the D3 title game, but for winning a variety ways, and almost always in dominant fashion, the Grafton Indians are my top football team in Central Mass for 2016. Nobody saw the Colonials coming. Sitting at 3-3 after back-to-back losses to rivals St. John's (Shrewsbury) and Algonquin, Shrewsbury went to St. Peter-Marian and ground down the Guardians, then clamped down on Leominster on the final night of the regular season to grab D2 Central's last playoff spot. Once there, Shrewsbury's magical run continued, as the Colonials avenged previous defeats by knocking off St. John's and Algonquin in consecutive weeks, then throttled Westfield in the state semifinals. All this with a sophomore quarterback in Drew Campanale, and a number of underclassmen contributors all across the field. The future is certainly bright for this program. While they ultimately fell to Duxbury at Gillette, this Shrewsbury team will no doubt be remembered as one of the best in school history. The Pioneers feel victim to one of Shrewsbury's upsets, but managed to rebound in the "non-playoff" games, scoring impressive wins over Wachusett and St. Peter-Marian. Add in their regular season wins over Catholic Memorial, Shepherd Hill, Shrewsbury, Leominster and Algonquin and this team is clearly deserving of its lofty ranking. With a loaded junior class returning for next season, led by quarterback Steve Bucciaglia and 6-foot-5 receiver/defensive end Hunter Gorgas, St. John's will once again be one of the most dangerous teams in the state. The Tomahawks made a surprise run to the D2 Central Final, and proved to be one of the most balanced teams in the region. After back-to-back losses to Shepherd Hill and Leominster, many thought the T-Hawks were dead in the water, but they responded wins over Shrewsbury and Wachusett to clinch a playoff spot. This program is clearly headed in the right direction, and soon it may not be odd to see Algonquin in the playoffs. The Tigers' Cinderella run ended at Worcester State against Millis-Hopedale in the state championship game, but you have to be impressed with what this group of only 26 kids was able to accomplish. While short on bodies, they were long on heart, and fought their way to wins over Littleton, West Boylston, Blackstone Valley Tech and St. Bernard's, proving they were the top small-school team in Central Mass this year. Marlboro bullied its way to the D2A Central and Mid-Wach B titles, pounding opponents on the ground, and flying around on defense. The Panthers' run would end against eventual state champion Falmouth, but even that game showed Marlboro's grit, as the Panthers became only the second team to stay within a score of the Clippers all year. Nobody could have predicted how dominant Wachusett would be this regular season, but a difficult matchup against Algonquin sunk the Mountaineers in the playoffs. Still, it's hard not to be impressed by the toughness of this group of kids, who persevered through injuries and a brutal schedule to have one of the program's best seasons in recent memory. Running back/linebacker Cole McCubrey enjoyed a fantastic senior season, and the Lions came within one play of the state championship game in Division 4. A pair of wins over small-school power Littleton were the highlights of the year for WB. 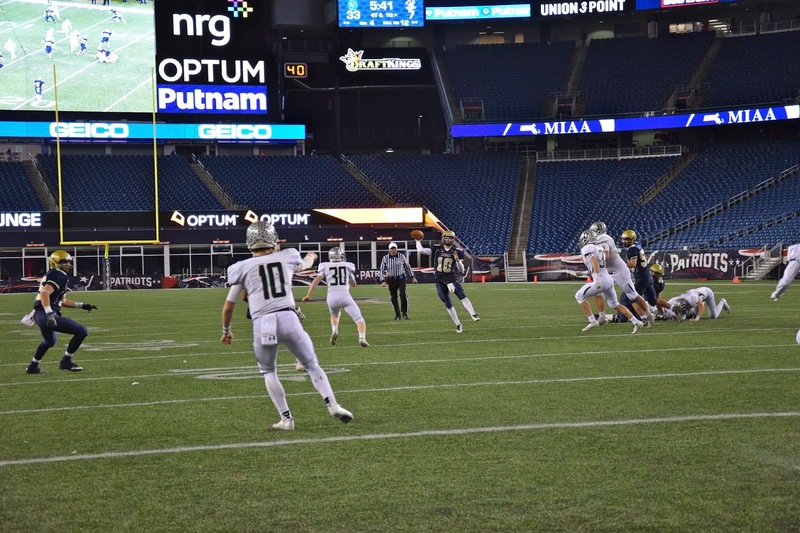 The Chieftains couldn't repeat as state champions, but Nashoba was still as tough a team as there was in the region. A more experienced Marlboro team got the better of them twice, but the Chieftains still gutted their way to impressive wins over Shepherd Hill and Doherty. I think it's safe to say that coach Jamie Tucker has returned this program to perennial winner status. The Guardians continued to improve as the year wore on, culminating in an upset of Auburn in the D3 Central semis. With quarterback Danny Malm and the do-it-all P.J. Barry running around, containing SPM was a tall task for anybody. Grafton..seriously? After that egg they laid in Gillette? The most unimaginative offense on display last Saturday. Did they complete one pass? They hitched their wagon to one star, but that does not make a complete team. If youre making an argument for Shrewsbury, Id leave out the part about not playing well at Gillette. Maynard was the only CMass team that was actually competitive Saturday but I don't think anybody would rank them #1. Agree 100% Joe, this is a tough call. Both had great seasons with harsh finishes. Thanks for the great coverage all year, now get to work on lacrosse!